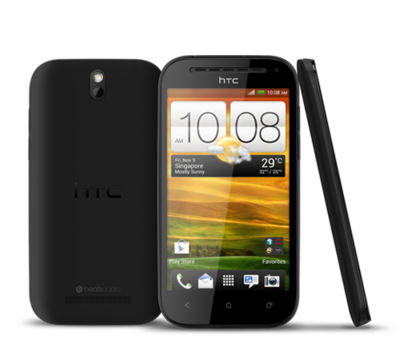 HTC announced Tuesday that it will soon offer the One SV with 4G LTE in the United Kingdom on EE. The device is equipped with a 4.3-inch super LCD-2 display, a 5-megapixel camera capable of recording 1080p video, a 1.6-megapixel front-facing camera for video chat, Beats Audio, a 1.2GHz Qualcomm Snapdragon S4 processor, NFC and more. Unfortunately, however, it will launch with Android 4.0 Ice Cream Sandwich instead of the newer Android Jelly Bean OS. Neither HTC nor EE disclosed when the One SV will be available or how much it will cost, but HTC said those details will be announced “in due course” and that the phone will be available through its retail partners in the coming weeks. LONDON — 11TH DECEMBER, 2012 — HTC, a global leader in mobile innovation and design, today unveiled the latest model in its award-winning One series, the HTC One SV . This new model combines the superfast speed of 4G LTE, an amazing camera and studio-quality sound with HTC’s stunning signature design. Running HTC Sense™ 4 on Android™ ICS, it is designed for those who want their smartphone to keep pace with their hectic lifestyle. Dependable, superfast performance Featuring a 1.2 GHz Qualcomm Snapdragon S4 dual core processor, and taking full advantage of the latest mobile network technology, the HTC One SV offers exceptional performance, enabling high-quality video streaming, gaming and seamless multitasking. Never run out of space for documents, movies, pictures and apps with Dropbox and SkyDrive integration, which, supported by HTC One SV’s Micro SD card slot, expands the onboard memory by up to 32GB per card. Thanks to the latest NFC technology and Android Beam, you can also share your content with a simple tap of the phone to another NFC-enabled device. Amazing camera, authentic sound The HTC One SV offers the amazing camera synonymous with the acclaimed One series. Advanced functions, including one-press Continuous Shooting and VideoPic combined with advanced low-light performance for beautiful shots in challenging lighting conditions. The HTC One SV’s 5 megapixel, f/2.0 Back Side Illuminated main camera with Panorama and 1080p HD Video Recording is complemented perfectly by a 1.6 megapixel front facing camera, which also features backside illumination, and an f/2.2 lens. Whether at sunset or in candlelight, the HTC One SV’s front camera promises a self-portrait to treasure. polycarbonate body is solid yet soft to the touch and is set off by matching silver or metallic rim belts, and colour-co-ordinated mesh for a premium finish. Availability The HTC One SV will be available in the UK via selected operator, retail and distribution partners in the coming weeks. Launch partnership with EE HTC is delighted to announce that EE will be a partner for the HTC One SV. With 4G LTE capability, the HTC One SV represents a powerful option for customers to take advantage of EE’s mobile network. The combination of the HTC One SV’s outstanding performance and EE’s superfast 4G network make for an ideal partnership. Details on the HTC One SV from EE, including availability and pricing will be announced in due course.